Don’t let your body and its demands rule your life. Be true to yourself. Don’t try to impress others. Don’t compromise with the world. Look to God for your good. SO UNITY FOUNDER Charles Fillmore points to the mistake we may make as human beings, feeling that life must take its toll, that it must be difficult and stressful. This is not so. When we serve God, and God only, our life is harmonious, free, loving and happy. It is only when we let that old devil, the human side of our nature, take over that we become tense, anxious, worried, hurried, fearful and over-burdened. It has nothing to do with God or His world. It is simply the result of our allowing the human in us to control our lives by controlling our thoughts, our feelings and our reactions to life and living. But there is a better way. We are not to allow the limiting, limited concept of human consciousness to make us fearful, worried and ineffectual. Instead, we are to remember that it is our divine right to be happy, successful, free, whole and fulfilled. It is not God’s plan for us to suffer stress and strain. Strain comes from listening to the adverse consciousness, the perverse human side of our nature. And when we recognize its wiles and its guile for what they are, we can break out of the chains that have bound us in consciousness and free ourselves into the greater experience that awaits us as children of God in expression as well as in potentiality. Let us take a good long look at the devil, the human factor in our lives, and then let us release him forever. The devil is not a man in a red suit, with a long tail and horns. Satan is not a person at all, but rather is that in us which leads us astray, our own wrong thoughts and feelings. During the time of Jesus and for several hundred years afterward, the devil was considered a spirit of sorts, an intangible influence, not a person. Then where did we get that picture of the devil that is so well known today? It evolved over many years as individuals tried to personify evil. In many ways they were reverting to the earlier pagan religions and their many gods as they drew various representations of the devil. Since there was no description in the Bible, they had to use their imagination. Different forms were given to Satan as they let their imagination run wild, and finally the most popular representation became a creature that was half man and half goat. During the Middle Ages the devil, still the figment of someone’s imagination, began to wear clothes. According to the stories, he could sometimes pass as a man, but sooner or later his horns, tail and cloven hoofs gave him away. As the belief evolved, many people became obsesed with the idea of the devil as a man. An Italian goldsmith named Benvenuto Cellini was so fascinated by the devil that he began working intricate designs of him on the vases he was making. As he developed a detailed picture of the devil, he became so carried away with the idea that he was terrified of this creation of his own fingers and mind. Others who concentrated on the picture of the man in the red suit also became fanatical about this figment of their own imagination. Today we realize that Satan, as mentioned in the Bible, is not a man, but an idea. Nothing outside of us has any power over us — except the power that we give it. However, if we feel that the world is against us, or that there is inequity in conditions in our life and no hope for the future, then we are serving Satan, a false belief. If we continually look around for someone or something to blame for the shortcomings in our experience, refusing to take control of our thoughts and feelings ourselves, we are playing the devil’s game. And, remember, the devil is real only inasmuch as we give him life by believing in wrong conditions and serving the false beliefs that they generate in us. Charles Fillmore describes the devil as “a state of consciousness adverse to the divine good” (The Revealing Word, p. 54). And a state of consciousness can be changed! But it can only be changed where it exists — within us, established in our thoughts and feelings. That is where we must attack the devil and root him out. This adverse thought, or error consciousness as it is sometimes called, has no permanence except the permanence we give it in our thoughts. It has no roots except the roots we send down into our feelings. And it can be changed at any time that we decide to withdraw the power we have given it in our lives. Error thinking cannot endure indefinitely, because we are essentially spiritual beings. And, regardless of appearances and our opinions of them, there is within us a Spirit that will never let us be satisfied with limitation, struggle, dissatisfaction and frustration. God in us is continually urging us to come up higher, to enter into the greater estate that He has prepared for us, His children. And God, Good, is always greater than error. 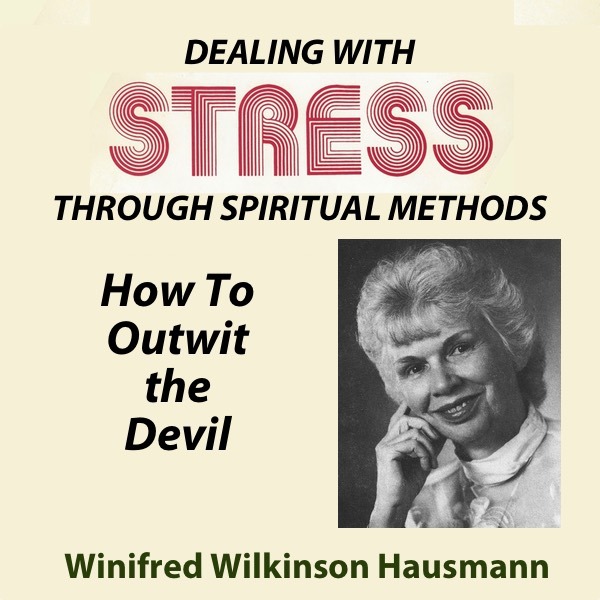 In transforming our lives, we may have to cope with the devil and outwit him, but when we recognize that he is within us as that old human consciousness, we cut him down to size and understand that when we stop supporting him by our thoughts and feelings, he has to give way to higher, better thoughts. This is our destiny, to let the good triumph over all limited thinking and feeling in our human nature. And we will be happiest when we are willing to release all devilish thoughts and feelings and let our divine nature shine through. When Jesus said, “If any man would come after me, let him deny himself and take up his cross and follow me,” (Matt. 16:24 RSV) He was speaking of the overcoming of this human nature that each must make for himself. Jesus overcame all that was human in His thoughts and feelings, and so can we, by using the same methods that He used. Jesus, our Elder Brother, our Wayshower, chose to incarnate in a physical body and to meet the errors of the human race thought. And in overcoming the basic demands of error thought, He gave us the great Example. ‘ After receiving baptism from John the Baptist, Jesus went into the wilderness to spend some time alone, preparing for His ministry. It was a time of soul searching and planning, preparation for the very full and busy three years He had to share the spiritual message. Since no one was with Him, Jesus must have told someone (perhaps Matthew) the story of His experience, and He told it in terms that people would understand. After fasting for forty days, He faced “the tempter” (Matt. 4:3 RSV). There is no indication that this was a person standing in front of Him, but rather it was something taking place in His thoughts, an overcoming that He must make before starting His great work. He handled each temptation by remembering a quotation from the Scriptures that applied. He had received His religious training in the Hebrew faith, and the appropriate words came to Him easily. First, He faced the temptation of the physical body. After forty days of fasting He was hungry. As He looked around the barren wilderness, he saw many stones, and he must have thought to Himself how much the stones looked like loaves of dark bread. Gazing idly at the stones and realizing the spiritual power that He had, He knew He could change the stones into bread to assuage His hunger. But something inside Him wouldn’t let Him use this great spiritual development for physical gratification only. He reminded Himself, “It is written, ‘Man shall not live by bread alone, but by every word that proceeds from the mouth of God’ ” (Matt. 4:4 RSV), quoting from the Book of Deuteronomy. It is a reminder that it was more important for Him to feed His soul than His body. He would not use His spiritual powers just to gratify a human demand of the body. Then He began to think about His ministry and how He should start. If He made some spectacular entrance into Jerusalem, surely that would attract the multitudes, and He could then teach them. It was the human way of approaching the whole situation. What entrepreneur wouldn’t approve a dramatic show of spiritual power to kick off a series of revival meetings? Jesus, in His imagination, pictured Himself on the pinnacle of the temple, and He knew that if He flung Himself from this high place, He would be unharmed. Truly that was a great human idea for attracting attention! But, once more, He remembered the spiritual nature of His mission and His early teaching, and He came up with another quotation from Deuteronomy, “You shall not tempt the Lord your God.” (Matt. 4:7 RSV) He could not expect to use spiritual power just for personal acclaim. Recognizing that He had highly developed powers, Jesus finally even thought of compromising with His spiritual principles in order to enjoy the world’s rewards. Through the power of His imagination, He pictured Himself as the head of “all the kingdoms of the world” (Matt. 4:8 RSV). With his understanding of the laws of the universe, He could take over the whole world and have power beyond anything anyone could dream about in a human way. He knew it, and He had to reach a decision about this before proceeding any further. As He told the disciples later, “You cannot serve God and mammon.” (Matt. 6:24 RSV) He realized that He could not slant His work toward personal gain, even the achieving of great power and position, but must direct His attention and His dedication to God only. He had made His great decision and was ready to start His spiritual ministry. He had outwitted the devil thoughts and was at peace. Luke’s version of the incident says that “when the devil had ended every temptation, he departed from him until an opportune time” (Luke 4:13 RSV). We do know that Jesus again had to face the temptation of His own thought as He prepared for the crucifixion and resurrection in the Garden of Gethsemane. But, for now, He was free to conduct His ministry without any advice or influence from the adverse consciousness. His spiritual nature was firmly in charge! We, too, have to face our own human thinking and to learn how to answer those little nagging temptations. If we don’t — if we allow our adverse consciousness to direct our life — then we will always have stress, and we will always be frustrated and unsatisfied. Fasting was not an uncommon practice in the Eastern countries. Moses and Elijah also fasted forty days. The idea in such fasting is to make the soul the master over the material side of life. It may not be necessary for us to fast from eating actual physical food, but if we are going to outwit the devil of human thinking, we must learn to fast mentally and emotionally from wrong thoughts and feelings. In the long run, this is the only way that we can rise to a higher, easier, more fulfilling way of life. Let us take a lesson from the temptations of Jesus. We are not here to serve our bodies, but our bodies simply function as vehicles for our souls. Consequently, we should put things in their proper perspective, recognizing that we must take dominion first over ourselves, over the human thoughts that relate to the material side of our living. This does not mean that we must give up eating, feeding our bodies, but it does mean that we are to let the body take its proper place. When Jesus said, “Seek first his kingdom and his righteousness, and all these things shall be yours as well,” (Matt. 6:33 RSV) He was giving us a formula for effective, prosperous, healthy living, free from the demands of the negative nature. Let’s look at the way our body may tempt us. Suppose we look at a serving of rich dessert and can almost taste it as we think, “One more piece won’t hurt me.” This is the satan side of our self, the adversary consciousness. This is what we have to overcome. The same thing applies to one who feels he has to have tobacco or alcohol or any other indulgence that his body is calling for. The same answer to the body tempter that worked for Jesus will work for us. When we put the physical part of us in the proper perspective, we will see that when we place God first, somehow the physical needs are taken care of in the right way without the stress and strain of overweight or physical upheaval. Our body is an important and necessary vehicle for living on this life plane, but it must be put in its proper place if we would take command of our lives. Had Jesus decided to make a spectacular entrance into Jerusalem by jumping off the temple heights and remaining unscathed, He might have impressed some people, but He knew that it was more important for Him to be true to His own spiritual nature and goals. He could not do something simply for its effect on others. And so it is with us. If we let our actions be dictated by others, or by what we think others may think, we will always be uncomfortable and ill at ease. We will always be looking to others for approval and satisfaction and will never learn to listen to our own inner Guide. The devil, in the sense of the worldly consciousness that wraps itself up in outer events, will lead us into doing things that we know are not for our highest good. Overspending is one of the channels through which we may go astray in an attempt to impress others. We are to be prosperous and to enjoy the good of life, but when we seek things as a means to impress others or to compete with them in conversation, then we are letting the adverse thought talk us into jumping off the temple. When we are true to that which is highest and best in us, we will not let our actions be dictated by what others may say. Following our own spiritual guidance, we may not always meet the approval of those who live by the world’s standards. But the best standard We can use is the standard of our own high goals and aspirations. As we keep our eyes firmly on our spiritual unfoldment, we will know what to do, and we will do it, as Jesus did — not for the sake of the effect it will have on others, but because it is right and we know it! Jesus made the correct choice, and so can we. In the long run, when we choose to follow the spiritual way that is right and good for us, we will have the greatest effect on others, anyway. They will see our spiritual light and will be inspired by it. Great pressure and strain is put on all who believe that it is necessary to compromise with the world, to do those things that they know in their heart are wrong. Personal ambition and the desire for great power and unlimited wealth may lead a person to compromise. Some experience this temptation when offered a job which is not quite ethical or honest. The devil, that nagging inner thought, has a way of justifying a lie here, a little misrepresentation there and overcharging on the other hand. More than one person argues that certain unethical practices are necessary to get along in the business world. Jesus could have argued that He would be able to accomplish great good in a position of worldly power, simply by compromising a little for the sake of the desired end. The high mountain which Jesus visualized in the third temptation symbolizes the height to which the human imagination can take us, the greatest rewards of power, prestige and honor that can be pictured in the mind. But even this Jesus was able to deny, as He understood that compromising with His highest ideals would defeat the whole purpose of His mission. He had committed Himself to worshipping and serving God only. In the long run, we gain much more than we lose by making our primary commitment to God and His plan for our lives. When we work for God first, we may very well acquire great wealth, position and power, but with God in charge of our lives, we will know how to use it for good. We will not be tortured by pressure and stress; we will not be fearful of losing our grip or missing out on something. Rather, we will have a sense of security and peace as we let God guide us in handling daily challenges. Under His direction, we will always find a better way, and we will know beyond the shadow of any doubt that it is not necessary to compromise with our high principles. As we meet the temptations that arise in our lives daily, being true to our highest ideals and taking command of our lives through our spiritual nature, we will discover that the old devil consciousness, along with all of his burden of stress and strain, has faded away. He wasn’t real, anyway.